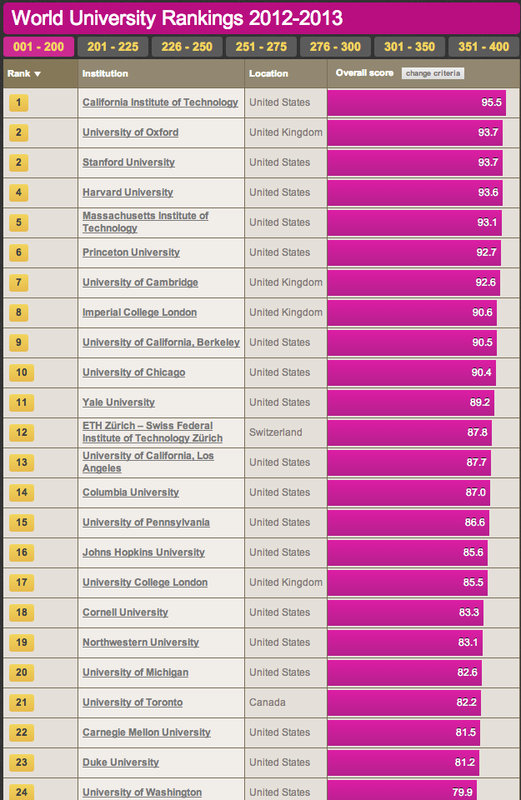 Welcome to the Times Higher Education World University Rankings 2012-2013. This is no beauty parade, writes Phil Baty: it is a serious evaluation that echoes in common rooms and the corridors of power. Global university rankings have become exceptionally powerful. The Times Higher Education World University Rankings are not only informing student and academic decision-making and helping university leaders and investors make strategic decisions: they are also shaping government policy. For example, they play a part in the allocation of thousands of national scholarships in Brazil and Russia, and are instrumental in determining the international partnerships forged by Indian institutions. Such confidence in the rigour of our research is testament to the hard work that has gone into developing the THE World University Rankings, making them the most comprehensive, sophisticated and balanced global rankings in the world. It also demonstrates the trust that we have earned through our consultative approach, our openness to criticism, and our pioneering partnership with Thomson Reuters, which supplies and analyses the rankings data according to our methodological requirements. But with power comes responsibility. Since rankings are used for an ever-expanding range of purposes, those who compile them must be frank about their limitations, clear about what they examine and explicit about how they are compiled. Our academic reputation survey, carried out in spring 2012, received responses from 16,639 experienced scholars – meaning that close to 50,000 academics have engaged with the exercise since it began in 2010. The 2012-2013 rankings – the ninth annual global rankings published by THE – also benefit from methodological stability. The 2010-2011 rankings, the first with data supplied by Thomson Reuters and with a new methodology, changed the game: a dramatically improved ranking system was launched after 10 months of open consultation and expert input from more than 50 leading figures from around the world. The 2011-2012 rankings built on our dramatic innovations and incorporated small but significant methodological refinements to better take into account a university’s unique characteristics. This year we employ a methodology identical in every way to that which underpinned last year’s tables, permitting clear and fair comparisons to be made. On that basis, the shuffling of the pack at the top of the table may be first to catch the eye. Harvard University’s fall from second to fourth place – by the tiniest of margins – and the University of Oxford’s move into second may grab the lion’s share of international attention. And of course, the California Institute of Technology’s consolidation as world number one (status it achieved for the first time last year) is something it will surely celebrate. But it is the bigger picture – the deeper analysis that serious rankings can offer – that is more interesting once the initial excitement of the race for the top dies down. It is in exploring this (pages 6-8) that we see further evidence of what has long been predicted: the rise of Asia. These 2012-2013 World University Rankings provide hard evidence that heavy support for universities in the Asia-Pacific region is paying off – top institutions in China, Taiwan, the Republic of Korea and most notably Singapore are on the up. Make no mistake, the traditional elite are under threat. The lessons are underlined by an analysis by Dirk Van Damme, head of the Innovation and Measuring Progress Division, Directorate for Education at the Organisation for Economic Cooperation and Development (pages 28-29). Van Damme highlights potential complacency among those at the top of the tables, with the traditional elite seemingly less effective at turning their great wealth and sterling reputations into research impact. He also highlights a remarkable cumulative decline for the US as a whole and identifies an exciting “sub-top” group of universities, harrying members of the old guard and preparing to steal their crowns. The world of higher education is changing, and the rankings help us to make sense of what is happening. These rankings were conceived to be much more than an annual beauty parade or marketing gimmick for university recruitment offices. We are delighted to continue to deliver what we promised we would. Phil Baty is editor, Times Higher Education Rankings.